New York Forklift Training Can Get You the Job You Want! The hustle and bustle of New York City attracts people for many reasons. The shows, the nightlife, the access to famous landmarks – these are just a few reasons folks gravitate to New York City for forklift training and certification. The career opportunities are a big part of it too. With its proximity to Canada and the myriad of warehousing and industrial jobs available, anyone seeking forklift certification NY has the opportunity to make a living out of something they enjoy doing. Even though they are widely used, forklift are dangerous pieces of equipment. They cause hundreds of accidents every year on worksites, and a big city like New York is certainly no exception. In fact, with towering skyscrapers, busy streets and workplaces, and other factors in the city that never sleeps, New York City may present more challenges than a city of lesser size. If you are wanting to be a forklift operator but you don’t want to put yourself in a position to get injured or killed on the job, you need forklift training NYC hands down. Because the majority of forklift accidents are due to operator error, NYS forklift certification training is the most effective way to protect your safety. This type of protection and security will also make you more appealing to potential employers, leading to less competition in the busy job market. Over the next 10 years, the number of industrial truck and tractor operations jobs is supposed to decrease by about 6%. Hopeful forklift operators in New York City will need a variety of skills as well as the appropriate forklift training in New York to compete. If you’re ready for the forklift jobs in New York, it’s time to take part in forklift school training that can get you prepared and make you competitive in New York’s job force – with a trusted NYS forklift certification. New York employers are expecting you to have completed this important step. There are many reasons to get forklift training NYC, but there are also many benefits to choosing an online program over a costly in person training course. At CertifyMe.net, we offer all of the features listed above, and more. It should be easy and convenient to get the high quality forklift training NYC you need to protect your safety and get into a new job fast. Where are the forklift jobs in New York? As always, transportation is a major force in New York City and airlines are always hiring employees with forklift training in New York. JetBlue is a major airline looking for operators with their NYS forklift certification right now. Forklift jobs in New York always available for workers with the right forklift training. New York’s Jet Blue at John F. Kennedy Airport is looking for expert drivers with forklift certification NY. New York is a huge city, and it’s a good shot that many other airlines that fly into JFK or LaGuardia are currently looking for new employees. If you’re looking for a big name company with benefits, Coca Cola is the way to go. New York City’s Coca Cola Bottling branch is hiring at the Borden Avenue branch in Maspeth. Employees who work in Maspeth are required to have the appropriate forklift training NYC. New York state standards and federal standards for OSHA training apply. Visit this page for an application and more information. One of Anheuser-Busch’s main offices is in the Bronx. If you’re a beer fan, working for a company like Busch could always be a plus, especially if you have the right forklift certification NY. New York is home to so many great companies like Busch. Check out Busch’s available careers. Careers at Busch are possible with the right forklift training. New York’s Busch warehouse offers good benefits and the chance to work in a cooperative, friendly and safe environment. All of these forklift jobs in New York are available for those with a New York forklift certification card. But where do you get NYS forklift certification!? There are numerous forklift training NYC programs, but not all of them offer the same level of quality. Many New York forklift training programs require students to attend in-person classes inside a facility that may span the course of a few days, and cost more to cover teacher’s wages. But it doesn’t have to be this way. Forklift training can be easy, convenient and cost less, with CertifyMe.net’s program that was created by and for the busy forklift worker. This New York Daily News story from December of last year discusses a teen becoming critically injured after crashing a forklift. Could inexperience have something to do with it? The more experience and education you have, the more you’ll be able to demonstrate your capabilities to New York City employees. If you’re ready to receive the proper NYS forklift certification in New York needed to secure one of the many forklift jobs in New York, you’re ready to take things to the next level! At Certifyme.net, we can help you with courses that will get you certified and prepare you to enter the work force with forklift certification NY. New York is the place to live and work if you’re looking for the urban life, and the right education options can take you so much further! The online forklift school with CertifyMe.net only takes about one hour to complete, is OSHA-compliant, can be accessed 24/7 on any device, and only costs $59.95. There are also equipment-specific modules to choose from to make the most of your time and money, which cover warehouse forklifts, pallet jacks and order pickers, and rough terrain forklifts. So sign up today and qualify yourself for a forklift career in New York City! OSHA is cracking down harder than ever on employers and workplaces that do not follow a strict safety protocol. They will be adding additional regulations to their agenda this year, and they have increased their fines. Your employees need OSHA-compliant, up-to-date NYS forklift certification so that they do not cause any injuries or fatalities on your work site due to ignorance of proper safety measures and equipment handling. 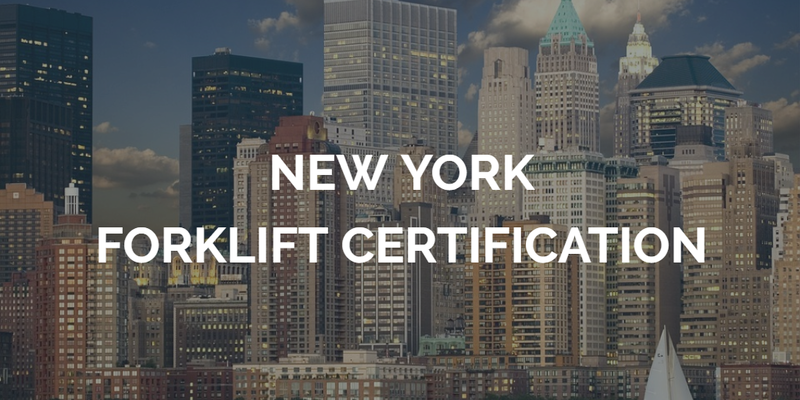 Read this blog for more information on New York City forklift certification.